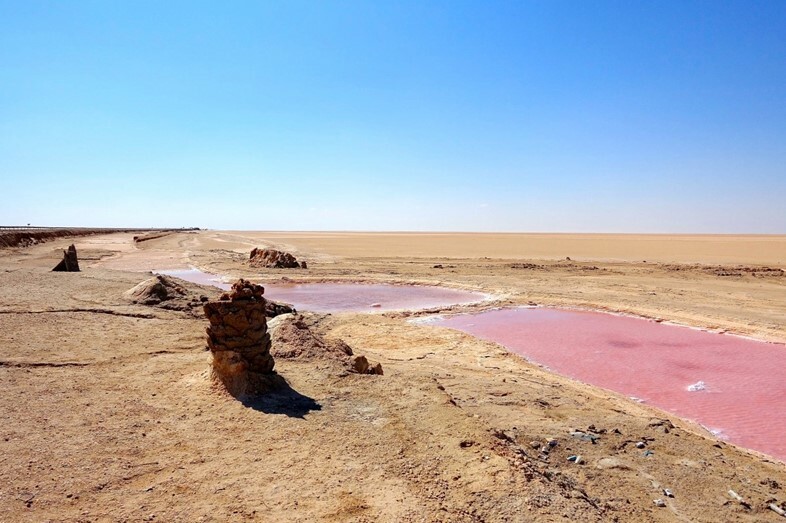 Stretching more than 7,000 square kilometres across the barren deserts of Western Tunisia, Chott el Djerid is a vast salt lake that extends to the stars. An ‘endorheic’ basin, it floods in winter with rainwater and run off from the distant Atlas Mountains, with dissolved minerals forming delicate pinks, soft greens, baby blues and other subtly beautiful colours. As spring turns to summer, crystalline structures emerge as the fierce Saharan heat turns the shallow waterways into glittering desert once more. Landlocked, arid and largely lifeless, Chott el Djerid is like a landscape from another world in more ways than one. In millions of 70s and 80s kids’ imaginations it’s the home of Luke Skywalker in Star Wars, a desolate place stretching away towards a horizon where twin suns set over the isolated planet. The empty desert around nearby Tozeur and the town of Matmata – filled with incredible vernacular architecture, retrofuturistic doorways and daubed mud paintings – gave the original film its dusty desert realism. Back in our own galaxy, Chott el Djerid lends its name to a similar feature on the largest of Saturn’s 62 known moons: Titan. 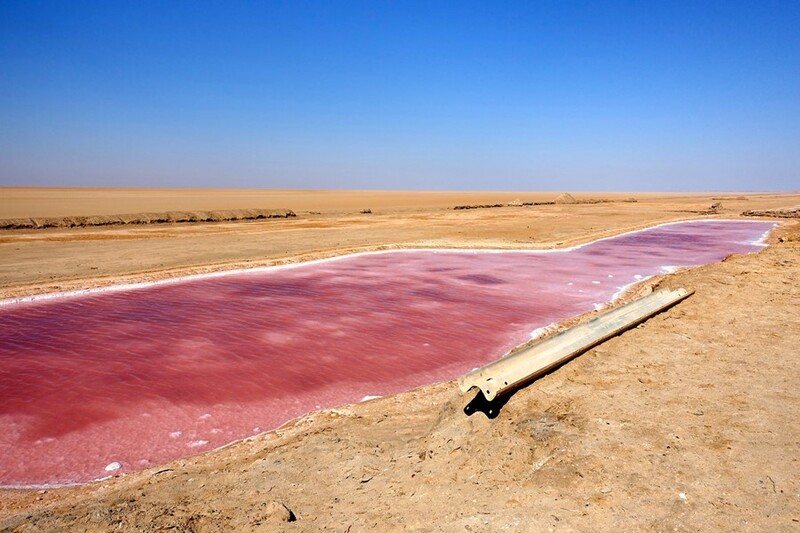 The Jerid Lacuna basin there is similarly endorheic – with material evaporating to form a shallow lake bed. 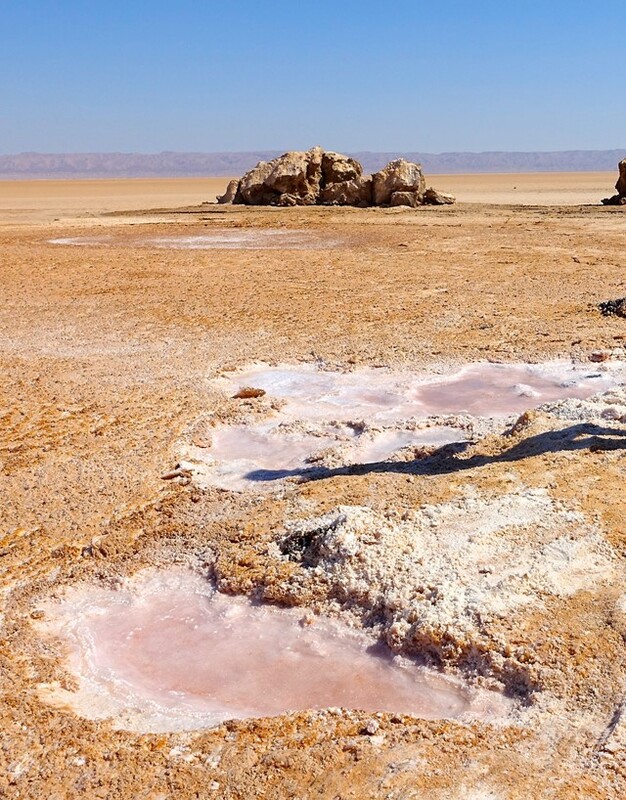 In Tunisia, the water leaves behind dissolved sodium chloride, calcium sulfate, magnesium sulfate, calcium carbonate, potassium chloride and magnesium carbonate – but on the distant moon it’s the interaction of liquid methane and ethane instead of water that forms the landscape. Most recently, scientists studying the 140km wide Holden Crater on Mars have looked to Chott el Djerid as an Earth analog. Located in the MC-19 region of Mars, Holden is located in the planet’s southern highlands and may, like its Saharan counterpart, be an evaporite basin – where evaporating water leaves salty mineral deposits. Both are depressions in the surface, where ancient water once ran down to form deltas, lakes and clay deposits. This makes it Holden Crater a prime spot to study the planet’s evolution, and it’s on the shortlist as a landing site for NASA’s upcoming Mars 2020 Rover. The British Foreign & Commonwealth Office currently advises against all but essential travel to Tunisia, but if you’re keen to go Ali Touareg offers great value 1-3 day tours of the area. For a list of Star Wars locations the official site has a detailed travel guide. See more of Kathryn Armstrong’s photographs of Chott el Djerid here.